The Mapex Drum Company has announced their updated Falcon series hardware by introducing several new models that are due to land in stores in April of 2013. All Falcon models offer players extreme adjustability, supreme playability and touring level durability that players can depend on night after night. "We spent a lot of time working with artists to define the concept based on their real-life needs. They felt that extreme adjustability was the goal, but only if the adjustments could be made simply and quickly. Knowing their needs were shared by all drummers, we designed a collection of hardware that includes simple to operate features and conveniences that would benefit players in the studio, on tour, or even in the woodshed." - Michael Robinson, KHS Director of Marketing. 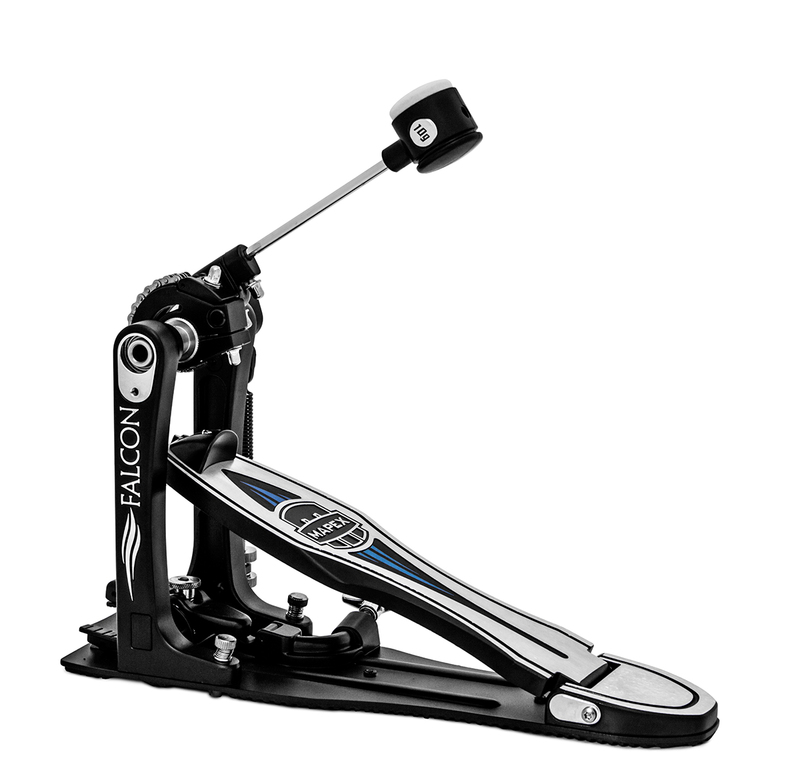 The new Falcon bass drum pedals are designed to give drummers optimal adjustment and are designed to be the smoothest-playing pedals ever made. New features include: a reduced base plate size; interchangeable drive options; footboard height adjustment; a self ?adjusting hoop clamp; beater angle adjustment and interchangeable beater weights. The new Falcon Hi-hat stand features: a lockable quick-release wing nut on the clutch; extreme height adjustment; a foldable footboard that clips onto the stand for easy transportation; footboard height adjustment; tension adjuster; removable swivel legs, and high-friction rubber feet with retractable spikes. The new Falcon snare stand features: a centered omni-ball snare basket; hi-friction rubber feet with retractable spikes and offers extreme base height adjustment. The new Falcon boom stand features: a single-point boom arm adjuster with position markers; a super-glide step-less tilter; a lockable quick-release wing-nut and a hide-away boom arm.